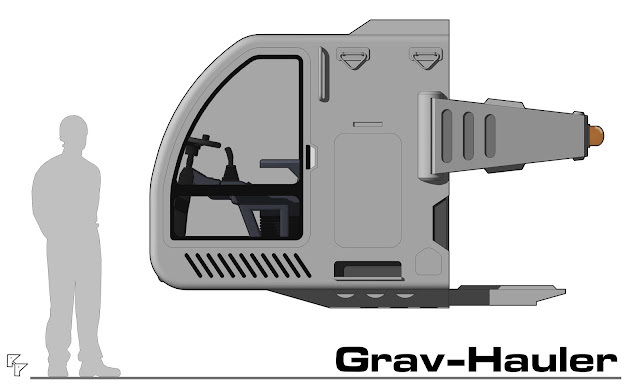 Possibly the smallest of the small craft, the Grav-Hauler is a one man anti-gravity vehicle used to transport small cargos. It's performance when loaded is very similar to the standard air/raft, and is slightly faster when unloaded. It is most frequently used to haul single standard 4 dton containers, but two containers can be linked and hauled together with some loss of performance. The cabin allows for 12 hours of life support, and contains an emergency vacc suit which will provide an additional 12 hours. It is possible for a second occupant to squeeze into the cabin, essentially on the pilots lap, but all operations are performed at a skill level of -2 and life support time is halved. The vehicle requires the Pilot skill or Grav Vehicle skill to operate (level 0 is acceptable). 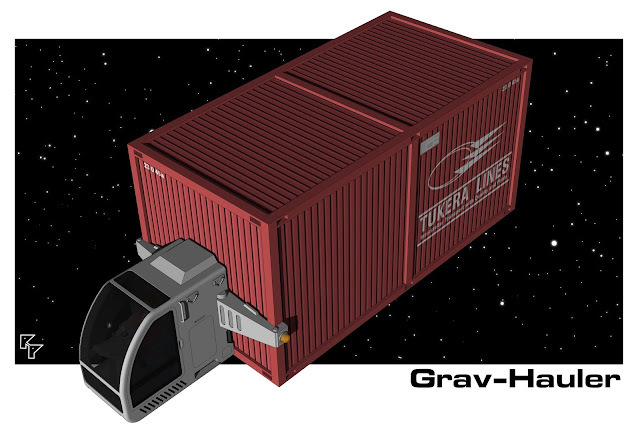 Operation of the cargo clamps and cargo grav units is fairly intuitive and no special skills are required for basic manuevers. Cargo Handling skill is recommended for anything more difficult. 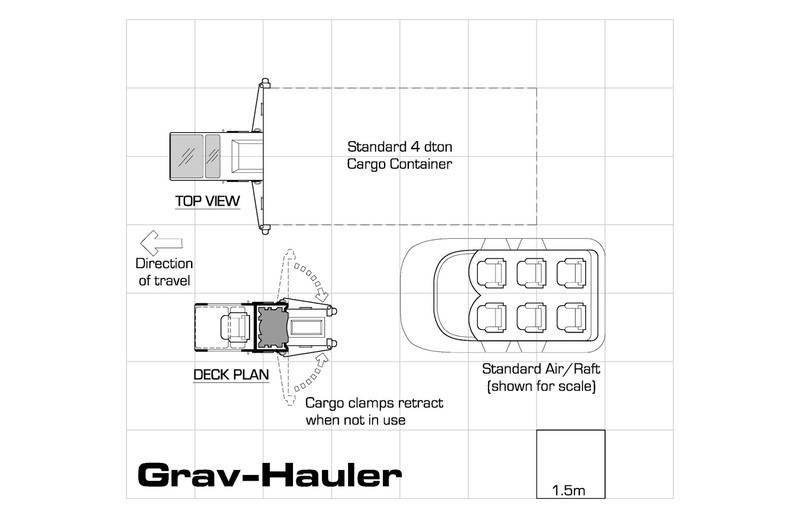 The Grav-Haulers cargo clamps retract when not in use and the vehicle only takes 1 dton of space, so they are often carried aboard larger cargo ships. The Grav-Hauler is an ubiquitous vehicle, and can be found at nearly all starports and spaceports, transporting goods across the planet or across town. Pilots of these craft are often part of a close-knit community and are known to look out for each other. It looks like a grav lifter for conex boxes, or one of those one man tractors used around cargo terminals to me. A very useful bit of 'chrome' to make games come alive. That's basically what it is. Or a one man enclose air/raft with a tow bar. Thanks! I like creating these utilitarian bits of fluff and imagining how in-game users would abuse them for entertainment. I was at a golf course in Hawaii years ago for a big wedding reception. While the majority of the staff was focused on keeping the reception on track, the junior staff were putting away the golf carts for the evening. But not before having races and spinning donuts. Very fun to watch. I'm gonna use that in tomorrows new game. But with a fold-down grav web that the container rests on. Moderately fragile if prmitives get hostile.